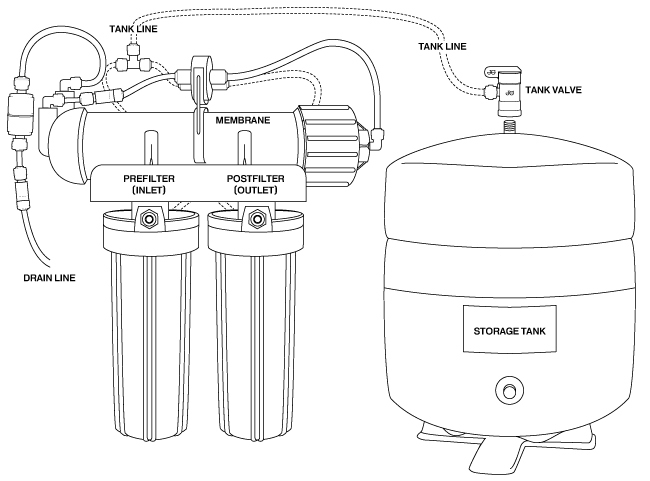 The instructions below detail the steps needed to convert a Countertop Reverse Osmosis unit to an undersink RO unit similar to our Black and White series. After converting the unit, follow the undersink installation instructions to complete the installation. Begin by mounting the ASO (automatic shutoff valve) on top of the RO membrane. Use the clip provided and position the valve so that the side that says “In” and “Out” points toward the end of the membrane housing that has a single tube – the cap end. Use a fresh piece of tubing to connect the “Out” port of the ASO into the recently vacated fitting in the membrane housing cap. On the other end of the membrane housing there are two tubes. One is the drain line. The other, which we'll call the permeate tube, attaches to the back of the white filter housing. Remove the permeate tube from its fitting and attach it to either of the vacant ports of the ASO (the one in back is usually best). Then clip the tube and insert the tee, as shown in the picture. If you need to add more tubing, feel free to add. Use a short piece of tubing to connect the now empty permeate port with the remaining empty port on the ASO, then insert one of the small white check valves into the tube as shown. Important: The arrow on the check valve must point toward the ASO. Insert the remaining white check valve into the drain line, after the flow restrictor, as shown in the picture. The arrow should point away from the RO unit, toward the drain. After you have assembled the RO unit, install it under your sink following the instructions for installing an undersink RO unit.